We have a brand new hero ready to take the stage. Introducing the eccentric Jester Queen! What bag of tricks will this Queen of the Harlequin bring to the Realm? Jester Queen is a mage with a sinister side. Sometimes called the Many-Faced Jester, this unpredictable vixen can go from whimsically nonchalant to diabolically dangerous in a blink-of-an-eye. There is rarely a rhythm or reason to her actions. It’s surprising that she has decided to aid the Mage Council, but how long will her allegiance last? That is a question no one can answer, not even Jester Queen herself! Jester Queen uses her magic and tricks to instill fear in her enemies. Her primary skill, Lightning Shock, deals damage and has a good chance to fear her victim, leaving them helpless for the duration. Her Grudge passive skill adds a powerful DOT to her attacks, while Wicked Grin greatly increases the Pierce rate and damage for her entire team. Jester Queen’s Malice and Wave of Spite are strong AOE attacks that deal significant damage to all enemies. In addition, Wave of Spite has a high chance to inflict powerful control effects such as silence, fear, and a huge -70% heal reduction. All 3 debuffs can trigger at the same time on enemies, ensuring their immediate demise. Joker’s Barrier is her defensive skill and can provide healing or shielding for the team. 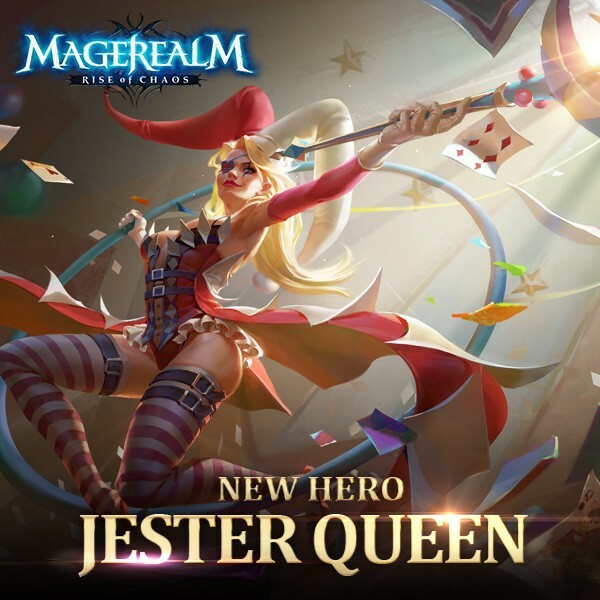 Are you excited to see Jester Queen in action? Come experience a huge fantasy world of steel and magic in this action MMORPG!